A Maiden Auction Stakes over 5f 59y on good going. Just seven two-year-olds take part. Five horses with race experience and two debutantes. There is a fair difference between top and bottom weight. 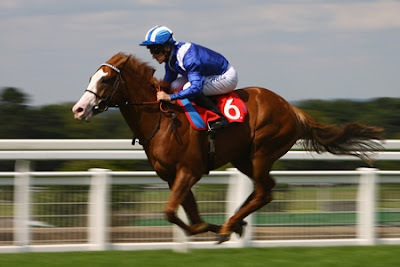 A very restricted race type which favours form horses. By all accounts a poor race. Tullinahoo is one of few juveniles trained by Denis Coakley. This bay colt is a son of Elzaam and £20,000 breeze-up buy. He has shown flashes of ability but disappointed to some extent last time out at Bath. A touch too keen when priced 9/4, this March foal finished fourth some six lengths behind the winner. Tom Queally takes the ride on this even money shot which tells the story that the opposition have hardly been catching pigeons at home. David Denis is a talented trainer. Blastofmagic is one of three two-year-olds to race this season with the handler for Tyre Hill Farm Ltd. This grey daughter of Hellvelyn cost £20,000 at the breeze-up sales when purchased by David Denis Racing Ltd. He was withdrawn from the sales as a foal. Half fancied in the betting on debut, a slow start, and detached in last, meant this youngster had a tall order and finished seventh of eight. It is difficult to assess this juvenile because even at this level improvement is needed. The betting suggests this juvenile has a fighting chance but at relatively short odds I couldn't bet. My trainer data is limited for Denis as he is a new trainer. If seriously backed, it may tell its own story. Trainers are looking for anything to bring improvement, and Surfina has the cheek pieces applied. This bay daughter of Acclamation showed a whisper of ability when sixth at Windsor when floundering behind Grey Gallion. With an official rating of just 54 that figure details that this race would need to fall apart for this juvenile to win. I sometimes say the worse a horse looks on debut the better they turn out to be. I'm not sure if that maxim will work for Lady Gwhinnyvere. This Irish-bred daughter of Sir Prancealot [who has done well as a first-season sire] was priced 100/1 on debut and tailed off last by some thirteen lengths. The mare won twice and was far from disgraced in the St Leger Yearling Stakes at two. Spearing is a canny trainer. Although this second starter looked as slow as a slug on debut, if seriously backed it would give some hope. If priced 13/2 & less SP would have each-way claims. The betting suggests, she will be the outsider of the field and if that is true take a watching brief. Chiconomic has show very little ability in two starts but drops down in distance. Rae Guest is a superb trainer but I would imagine he is looking to get this daughter of Clodovil a handicap mark. Generally, I would consider juveniles with form to hold an advantage at this grade. It may well be the case because the two debutantes were both cheap purchases which suggests they are no world beaters. However, they haven't yet proved they are limited, which the others, unless they progress with racing, have done. The most interesting horse in the field is Lord Clenaghcastle. This Irish-bred son of Big Bad Bob cost 6.500E at the breeze-up sales when purchased by his present owner Michael Baldry. The major hope for this bay colt is that he is fancied in the betting. If priced 13/2 & less SP there is a very good chance he will hit the frame. Conversely, if outside this betting guide I would take a watching brief. Interesting to see Hector Crouch is booked to take off a valuable 5lb claim. It's all about the betting with this horse. Michael Madgwick isn't the most fashionable trainer when it comes to training two-year-olds although he has had one or two show ability on debut. In that respect, it isn't beyond the realms he could have a fighting chance here. General Gerrard is a son of Captain Gerrard, gelded, racing in the familiar silks of Mrs L N Harmes, who did well with sprinter Multitask [changed owners]. This juvenile was purchased by the vendor for just 5,000G. I couldn't have any real confidence in this debutante as a betting proposition but in a race which looks like an egg and spoon race crazier things have happened. Conclusion: I think I set myself a challenge writing about this race. It is a very poor race and we are dealing with limited ability which is difficult to measure. We are talking more about how bad each horse is to find a winner rather than how good. Not the best pointer. The betting will be the key for most of these. If one has much more ability than seen it will be backed short. Tullinahoo has shown the most ability and may well win but even money seems short. I would bet on an even money shot with ability rather than one without. However, each to their own. Blastofmagic may hold claims. Lord Clenaghcastle is the most interesting. If backed to 13/2 & less SP I would take it as a significant sign. If weak, I would watch. A poor race and a watching brief for me.